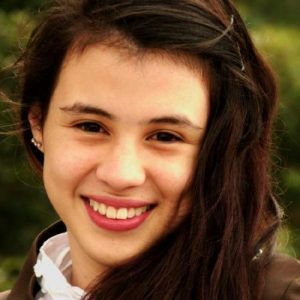 This week's PyDev of the Week is developer Maria Camila Remolina Gutiérrez! Find out how she got her start with Python and what she's up to these days! This week we welcome Maria Camila Remolina Gutiérrez (@holamariacamila) as our PyDev of the Week! Maria recently gave a talk at PyCon USA in their new PyCon Charlas track last month. You can learn more about Maria on her website or you can check out her GitHub profile to see what she has been doing in the open source world. Let's take a few minutes to get to know her better! My name is Maria Camila. I am a 23 year old Colombian. I am a Physicist and soon to be Systems and Computing Engineer (I will graduate in June 2018). I am studying at Universidad de los Andes in Bogotá, Colombia. My main area of research so far is computational astrophysics, especially simulations. I am very interested in the topics of infrastructure, high-performance computing, and security. Regarding my hobbies, I love pottery and ceramics, I have been doing it for 1.5 years so far. Also, I've been trying to learn bongo drums in my spare time. Finally, I love learning new languages, especially because it is binded to the culture of the countries that speak them, so it allows you to discover the world in a different way. Python was my first programming language. I used it first as a senior in high school at a Summer Science Program, in order to implement Gauss' orbit determination method. Me and my team made three observations of a Near Earth Object and we wanted to obtain its orbital elements. We used Python to implement all the algorithm and data processing. It was also my first time programming, so I loved how Python made it easier for me to get started in this area. I am finishing my undergrad education, I graduate this summer. I am preparing to start my master's in computer science in Paris, France in the fall. My two current and main projects are my research in astronomy and my undergrad engineering thesis. For the former, I am in the process of publishing my first paper as first author (!) on simulations of rotating Lyman Alpha galaxies. For the latter, I finished an implementation of a program for civil engineers that creates a minimum cost design of a sewer system, all using parallel computation. Numpy, Scipy, Matplotlib, and Pandas! I estimate that 90% of my imports are these four libraries. They are fundamental for my data processing, analysis, and plotting. I've used them in all my research for almost 5 years already. How did you become a part of the PyCon Charlas track this year? My motivation is that one of the world's greatest problems is inequality. However, I believe the current state of computation and technology has opened an era where accessing information is definitely easier. Now you don't have to pay for college, or even go to high school. All you need/want to know is at the tip of your fingers. However, not everything can be free, and this is not wrong, it's actually awesome how this industry gives people jobs. But this means that there is still software - really good software that could boost someone's life - that you can only get by paying. So I think that giving people the power of these private tools for free, is the best way to grow our society. What motivates me it's that what differentiates people is not their family inheritance, but their own personal work and effort. And open source allows this! Going to Pycon 2018 showed me how incredibly strong and kind the Python community is. I had a rough idea from online interactions, but I never imagined it to be this big. I think this is the best part of the language. That it joins people together, from all around the world, to create new products that exceed our expectations. And also to be humans together. I loved how there were open spaces to talk about mental health or to do cross stitching, there was even one to play board games! I think we should never forget to be people before programmers. And I believe all the Pythonistas I've met are exactly that. Thanks for doing the interview, Maria!